On this flight we flew our first leg a very short distance to Winchester VA (OKV) where we picked up 2 campers, Aliza and Tony, whom had been attending Brainy Camp. From Winchester we flew them both home to Pittsburgh PA .
We departed home base Luray rolling down runway 22 at 10:15 and as the wheels were coming up we were turning to the northeast heading for Winchester VA, which was only 37 miles away. Flight conditions were smooth as glass and clear. Winchester airport (KOKV) is a non towered airport which on this particular morning was very busy (we were only 1 of several airplanes coming in to pick up campers) Once arriving at Winchester we merged in with the traffic and landed on runway 32. The camp driver was to be at Winchester at 11:00 so we were ahead of schedule, but once inside we found out that they had already arrived and there were a group of busy campers gathered around giving one another their goodbyes ! 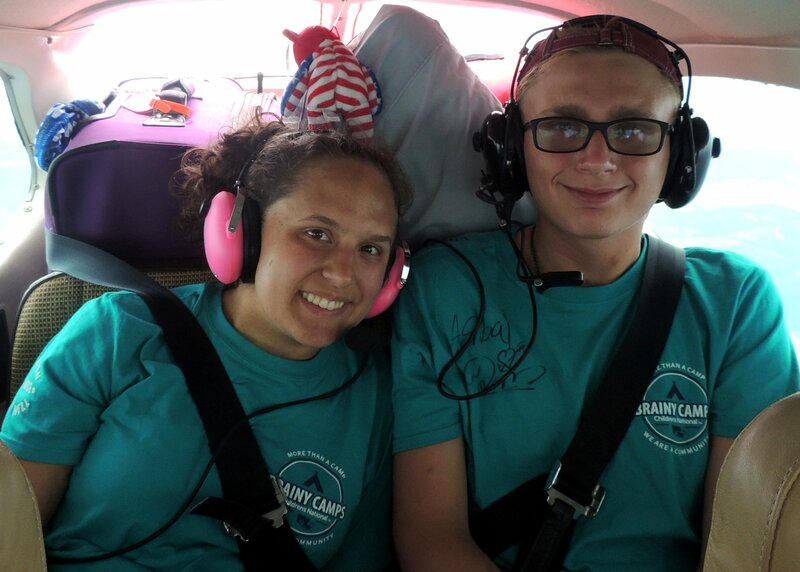 So we greeted our passengers, Aliza and Tony, then we mingled awhile talking with other pilots, allowing the campers to have even some time with their goodbyes to one another (we have found that with these type of camps, that there seems to be a strong bond created between the campers, even though they may be together for only a short period of time)….. then, after a little while longer we loaded up with Aliza and Tony and headed for Pittsburgh. We departed Winchester on runway 14 and soon after liftoff we turned to the northwest heading for Pittsburgh. We called for and received our IFR clearance in the air and we were cleared to 6000 feet. Our flight conditions at 6000 feet for the first half of our flight were very smooth and clear of clouds. As we continued we could see on our nexrad radar that we would be entering some precipitation that had some hot stuff (lightning) along its leading edge, but to the southwest of our course. Now, due to our flight planning, none of this was any surprise, nor did we feel that it would be of any concern as far as safety. (In some of the pictures below this story, you can see what our screen was showing us as we flew thru the weather) Sometimes the weather does dictate to use to change our course or even to make the decision not to go in the first place. As we continued on we had a pretty good view ahead due to the fact that the weather system consisted of quite a few clouds layers with spaces in between. ATC ask us a few times as we were flying thru the weather what our flight conditions were like so that they could pass the info on to other pilots. Our flight conditions thru most all of the weather were mostly smooth with only occasional light chop and very little rain. Allegany County (KAGC) Pittsburgh …. where we were landing….. was using ILS 28 for their arrivals, so as we neared the airport we were vectored in for intercepting the ILS for runway 28. Once we were cleared to land, and we were coming down the final, we broke out of the bottom cloud layer at about 1700 feet and John made a beautiful landing onto runway 28 (You can watch our video, located below this story, that shows all of our take off and landings, including coming down thru the clouds at Pittsburgh). As we were getting out of 49Bravo we were greeted by Aliza’s Mom and Dad and Tony’s Mom. There were plenty of hugs going around, and even John and I got quite a few ! (As Pilots we pride ourselves in abiding by many rules while on the ground…. such as, always be on time…….. never walk by cookies without stopping …… never go by a bathroom without using it……. and one of the big ones…… NEVER turn down a HUG) ! After getting inside the FBO we were treated to a fantastic lunch laid out in the conference room, provided by Aliza’s and Tony’s family ! (See Picture Below) We not only enjoyed great food, but also great conversation ! It was a very wonderful time. John and I would like to say a GREAT BIG THANK YOU to Denise Sedlacek (Tony’s Mom) and Patti and Jeffrey Weaver (Aliza’s Mom and Dad) …..We really appreciate your kindness ! After our great time with everyone we gave and received some more hugs and headed out to our safe place (49Bravo), then after receiving our clearance we departed on runway 28 and headed for home. Our route back home took us thru more weather, very similar to what we had coming to Pittsburg. It looked much more intense on our screens than it actually was, the lightning was along the leading edge and southwest of our path so we made no deviations and continued on our course. The ride was very good and the rain was light, with only a few brief downpours (which helped to get the bugs off) and it all pretty much ended as we crossed over the last of the Appalachian Mountains. Our approach back into home base Luray was a visual to runway 4 and Captain John done a beautiful job kissing the ground as always ! After tucking 49Bravo in her hanger we enjoyed a nice hot cup of coffee and talked of the day (Seems like John and I never run out of things to talk about !) Then, as always, we proceeded with a very dangerous part of our day, the ride home ! PS: As we got back over the mountains to Shenandoah County were we live, the storms that we left behind in the air were now ready to greet us on the ground…. rolling thru, they gave a few of our local areas some much needed rain ! Thanks for your time ! Following are photos of the day, hope you enjoy ! This little fella (actually a good size frog) greeted us this morning as we entered the hanger. He was inside along the hanger door. Would love to know the story behind the feather on his leg, but he would not tell ! John gently coached him into a coffee cup and I carried him over to the grass. I believe he was actually waiting to “hop” a ride ! Another shot of our visitor in the hanger this morning. This picture is for my wife (Sharon) …… anyone who knows Sharon knows how she loves frogs ! Boy, what a TREAT ! …….. This great lunch was awaiting us in the conference room at Pittsburgh, compliments of Aliza and Tony’s parents ! Thank you all so much !!!!!! What a treat (Great food and great conversation !) …. around the table left to right…. Captain John….Aliza’s Father, Jeffrey Weaver…. Tony’s Mom, Denise Sedlacek….. Me (Nevin)……. Aliza’s Mom, Patti Weaver…… Tony and Aliza (Our passengers) Thank you all so much for treating us like KINGS ! Please feel free to leave comments ……. we love them ! Just fill in the blanks below and click submit.